hrclightbright talks about stuff: First VLOG post EVAR! I talk about my exam anxiety, how I don't like underwater things biting me, my addiction to Twitter and at the end a tidbit of me being completely strange. Also I need to get better at editing. 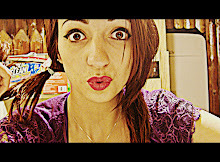 I would have put it on Tumblr, but the video uploader was being super lame balls. So back to Blogger it is! P.S. I swear a couple times. I'm sorry. Mouth of a sailor. Figuratively, people, figuratively.